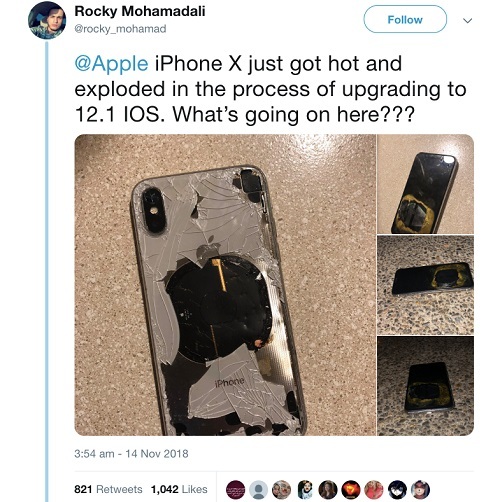 A man has called out popular phone company, Apple after his brand new phone reportedly exploded during software upgrade. The report about an exploding iPhone X comes only days after Apple admitted that the touchscreens of some models don’t work properly, in that they (occasionally or completely) fail to respond to the touch of users. “Apple has determined that some iPhone X displays may experience touch issues due to a component that might fail on the display module,” it explained earlier this week. And while the tech giant claims that this issue affects only a “limited number” if iPhone Xs, such problems tarnish its otherwise enviable reputation for secure and trustworthy products.